If you're visiting Montreal but unfamiliar with the city, choosing where to stay is an important decision to make, and one that can affect your experience. Montreal is vibrant and diverse, with hotels ranging from high-end boutique stays to budget options. Most are located downtown and in the old part of Montreal, near the water, but understand your options and know the advantages and disadvantages before you book. Montreal's downtown houses the majority of the city's hotels, including big names like Hilton, Marriott, Delta, Fairmont, Holiday Inn, and Novotel, and is where most people stay. 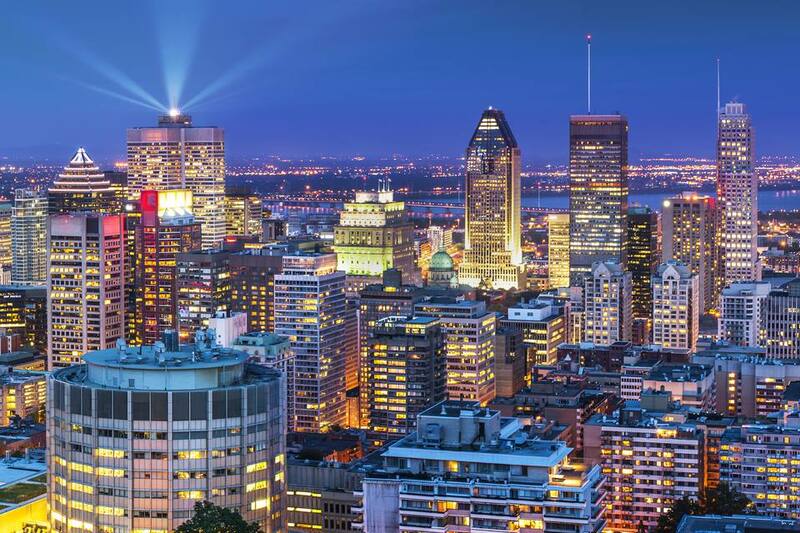 Essentially covering the southernmost area at the base of Mount Royal, which is Montreal's most prominent, natural landmark, the downtown is a big area. A little research will help you find the best location with access to the amenities you need. If you love shopping or are visiting McGill University, you may want to stay near Ste. Catherine. Maybe you want to be able to walk to Old Montreal, in which case, one of the hotels along Rue Sainte Antoine would work well. Some downtown Montreal hotels are connected or at least close to the city's Underground, which is a below-ground network of walkways full of shops, restaurants, and access to attractions and subway stops. In the bitterly cold, snowy winter, the Underground is particularly handy. Keep in mind that Crescent Street has a busy nightlife and the area where St. Catherine (the major shopping street) and St. Laurent meet - the eastern edge of downtown - has the reputation of being not the safest neighborhood and frequented by drug users and prostitutes. Old Montreal is like a little historic bubble neighborhood in a big cosmopolitan city. Very much preserved in its 17th/18th state, Old Montreal boasts cobblestone roads, a central grand cathedral, historic public spaces, intriguing alleyways, and stunning heritage architecture, much of which houses high-end, boutique hotels. Staying in Old Montreal carries a certain cachet because it is so unique and romantic (waterside location, horse and buggy rides, French cafés, wine...you get the picture). The neighborhood known as "The Plateau" is a residential part of Montreal, densely populated with a diverse population of hipsters, students, and young families. You won't find high-rises in the heart of the Plateau; most buildings are less than four or five stories. The most dominant architectural feature of the Plateau is the charming Victorian row houses with their characteristic exterior wrought iron spiral staircases. These 20th and 19th-century buildings are both residential and house the neighborhood's many cafés and boutiques. The Plateau's landscape does not include big-name brand hotels (though several sit on the border). This is not the spot if you're looking for high-end or luxury hotels but you may have great luck with a vacation rental; try airbnb, Vacation Rentals by Owner (VRBO) or Homeaway. Montreal has a bustling airport in Dorval and at least a dozen hotels to accommodate travelers, including a Marriott right inside the Montréal-Pierre Elliott Trudeau International Airport. The Montréal-Pierre Elliott Trudeau International Airport, airport code YUL, is about 13 miles (20 kilometers) - a 25-minute drive - outside of downtown Montreal. Staying at a Montreal airport hotel may make sense if you are passing through town, say, en route to Quebec City or Ontario, but not particularly convenient to visit Montreal for more than a day.